Posted on August 27, 2016 by Ching under Events. I had such a blast touring with the #WestarInMotion College Campus Tour this week. 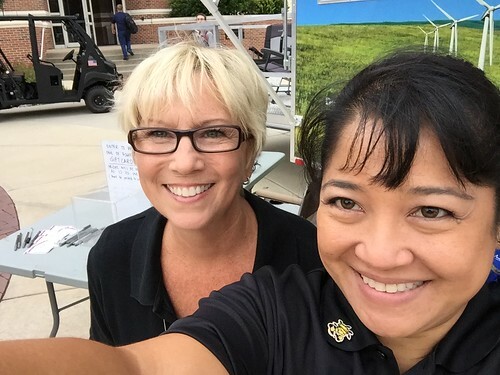 We were at Wichita State University on Wednesday, KU on Thursday, and K-State on Friday. 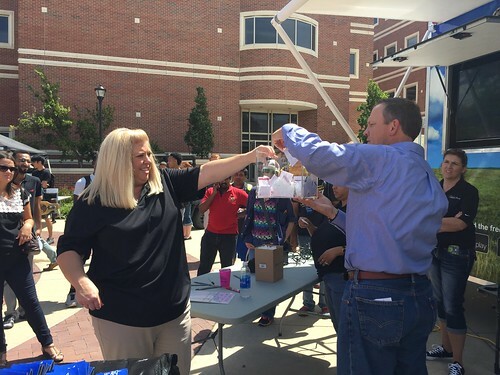 One of our senior officers, Greg Greenwood, stopped by while we were at Wichita State and even helped us draw our four gift card winners. 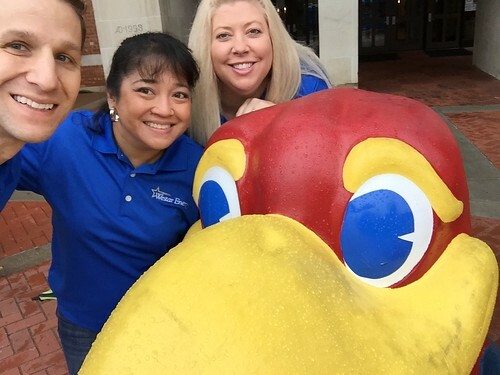 When we were at the KU campus, Derek, Mel, and I got a selfie with the Jayhawk in front of the KU Memorial Union entrance. 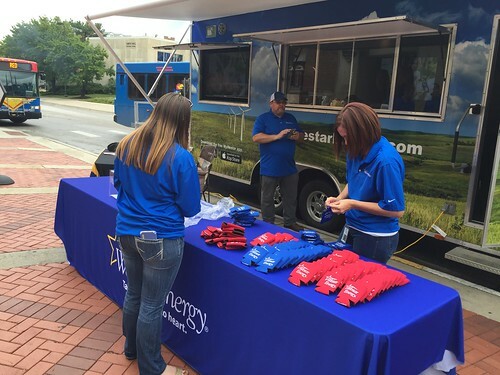 KU was the one school where our #WestarInMotion koozies actually matched the school colors. I wish we had yellow and purple ones made too but the blue and red are Westar colors so we will be able to use these koozies for other events. We had a blast at all three locations. But, even though I’m WSU alumni and I’m partial to the school, I have to say that the K-State kids were the coolest. They even tweeted our event and took selfies with us. I was a little bit worried because of the forecasted rain. We encountered rain when we were setting up the trailer at all three locations but, as luck would have it, the rain stopped in time for our event. We had a great turnout at all three schools. 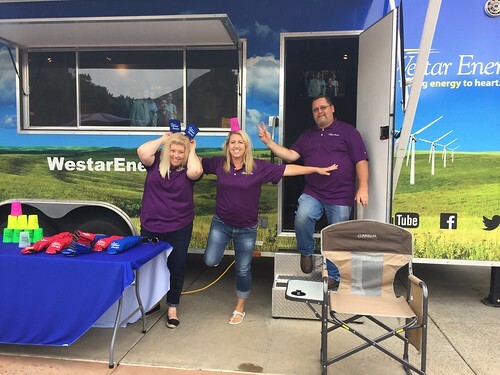 Although we ran into a few students who didn’t have electric service in their name, we had several people who installed the MyWestar app right on the spot. We were on our feet the entire time and the soles of my feet hurt really bad at the end of each day but it was totally worth it. The last three days were a nice break from the office. I’m so glad Alicia invited me to help her with this project. I hope I get to help with it again next year.